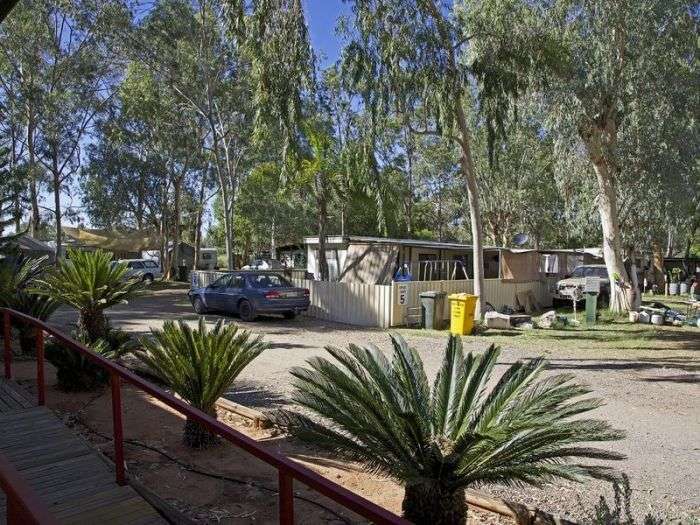 Welcome to the Heritage Caravan Park in Alice Springs, it is a our goal to produce and provide the highest quality experience for all of our guests. With a long history as a Pet Friendly destination, our dedication is to the inclusion and development of further first class Pet Amenities. We have recently installed a K9000 Tru Blue self service dog wash and a the new off leash area to expand our pet facilities. Our kiosk/shop stocks a wide range of grocery items, along with an extensive range of caravan spares. 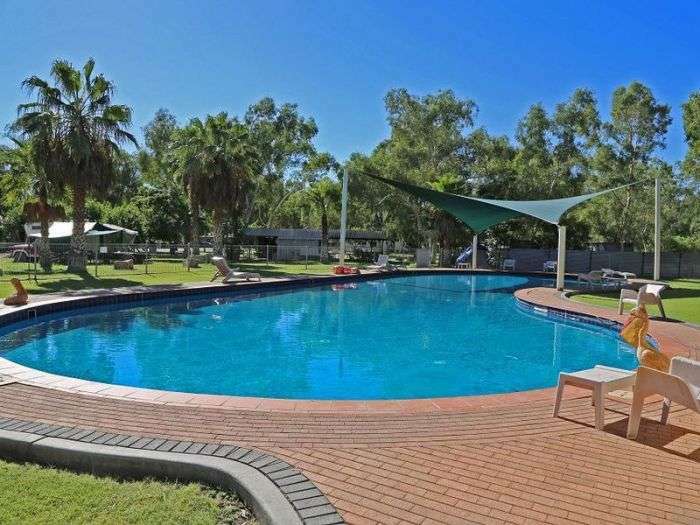 The swimming pool is one of the largest in Alice Springs at 500,000 litres The new children’s playground is now open. Nestled amongst the glorious MacDonnell Ranges the park offers cabins, caravan and camping sites a spacious BBQ area under a pergola, grassed camping sites, clean amenities and is pet friendly with our very own self service dog wash. Close to a range of Alice’s famed attractions the park is a great base from which to explore this fascinating part of Central Australia. 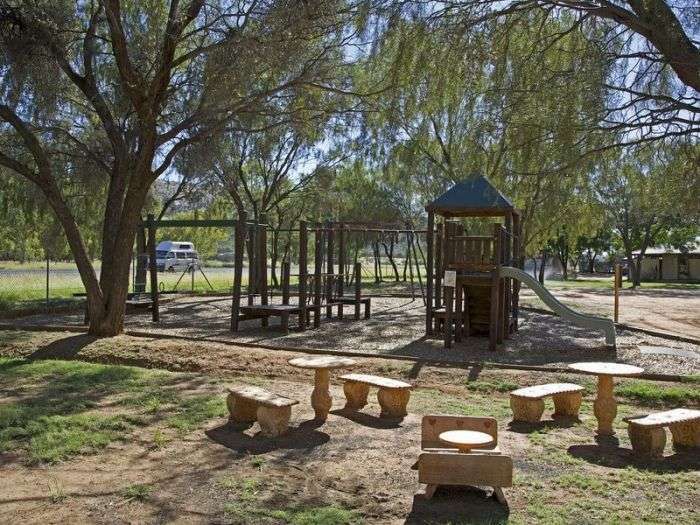 This park is perfect for families, overnight stays and travelLers of all ages. 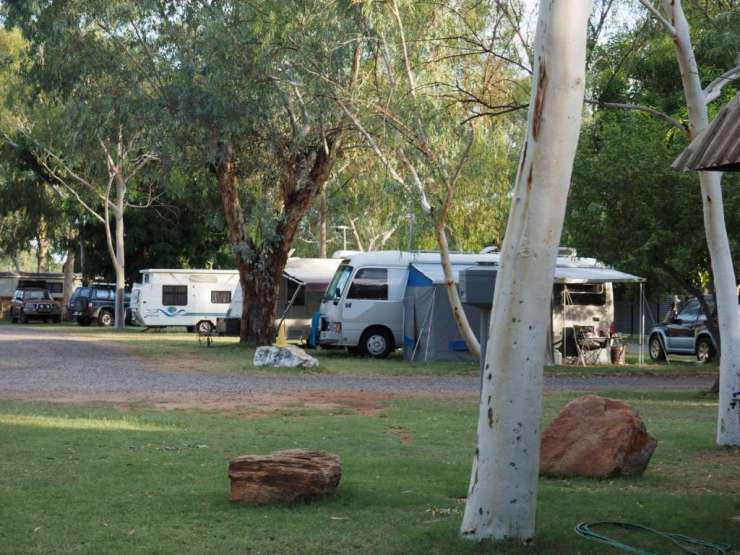 We hope you enjoy your holiday whether it be a short stay or a getaway Heritage Caravan Park is the ideal place for you to visit. Stop and take the time out to absorb the surroundings and great atmosphere. Come stay relax and enjoy!.......... BUSH CAMPING..........Amenities: Camp Kitchen, Childrens Playground, Coin Laundry, Pets 'Off Leash' Area, Shared Amenities, Swimming Pool.......... Camp amongst the lemon scented Eucalypts in our huge bush camping area..........POWERED SITES..........Amenities: Camp Kitchen, Childrens Playground, Coin Laundry, Pets 'Off Leash' Area, Shared Amenities, Swimming Pool.......... 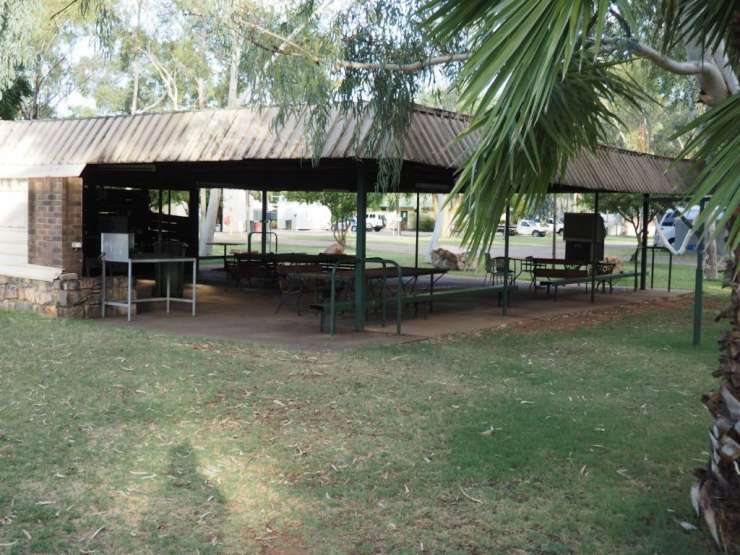 The Heritage Caravan Park offers grassed, shady powered sites with water access. Drive through sites available for larger vans, please ask when booking..........UNPOWERED SITES..........Amenities: Camp Kitchen, Childrens Playground, Coin Laundry, Pets 'Off Leash' Area, Shared Amenities, Swimming Pool.......... Grassed, shady unpowered sites available close to camp kitchen, swimming pool and amenities..........FAMILY CABINS..........Amenities: Bathroom, Childrens Playground, Fridge, Kettle, Kitchenette, Lounge Room, Microwave, Oven, Pets 'Off Leash' Area, Stove, Swimming Pool, Television, Toaster.......... 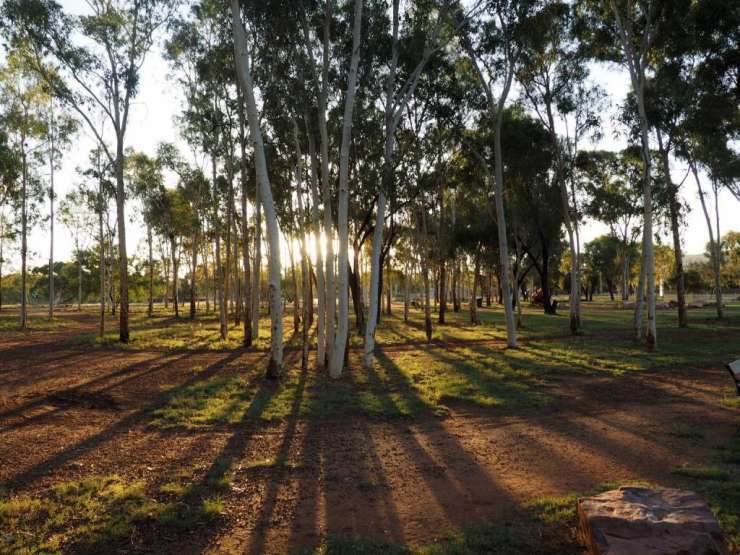 Surrounded by gum trees and views of the MacDonnell ranges our spacious family cabins feature two bedrooms, a lounge room, large bathroom and fully equipped kitchen. These cabins are great for longer stays. All large cabins have evaporative cooling, digital television, full sized fridge, microwave, stove and oven and outdoor seating on the veranda. With access to our large swimming pool, kids playground and pets off leash area, our peaceful family cabins are perfect for traveling families, couples and individuals. Bedding configuration is either two queen beds or a queen and a set of bunks. Additional beds and cots are available..........EN SUITE CABINS..........Amenities: Bathroom, Camp Kitchen, Children's Playground, Coin Laundry, Double Bed, Fridge, Kettle, Kitchenette, Microwave, Pets 'Off Leash' Area, Swimming Pool, Television, Toaster.......... Our cosy single room en-suited cabins, nestled in our very own native gardens are ideal for couples and individuals either passing through or wanting to explore Alice Springs. Each of our smaller cabins contains either a double bed or two single beds, microwave, kettle, toaster, small fridge, TV, split system air conditioning and small en-suite. These cabins are perfect for those traveling with pets, most en-suite cabins have a small pet yard out the front..........BASIC CABINS..........Amenities: Camp Kitchen, Children's Playground, Coin Laundry, Double Bed, Fridge, Kettle, Kitchenette, Pets 'Off Leash' Area, Shared Amenities, Swimming Pool, Television, Toaster.......... These smaller cabins are neat and simple with amenities block, and camp kitchen nearby. 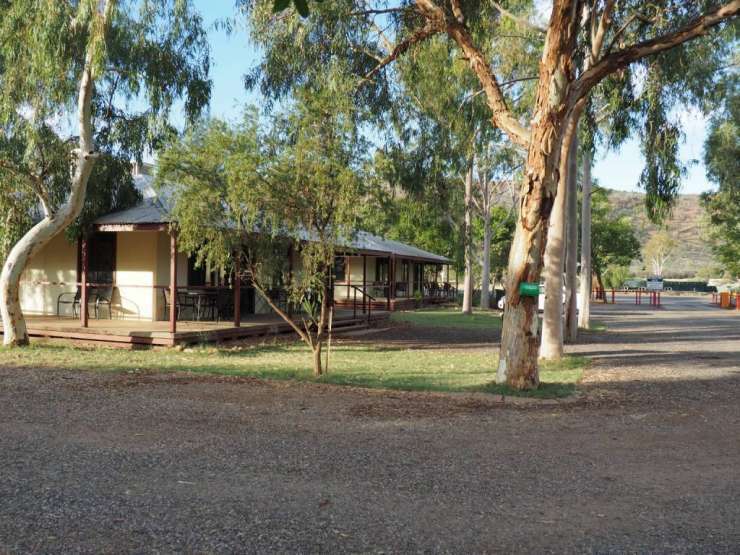 They feature a double bed, fridge, kettle, toaster, tv and split system air-conditioning. 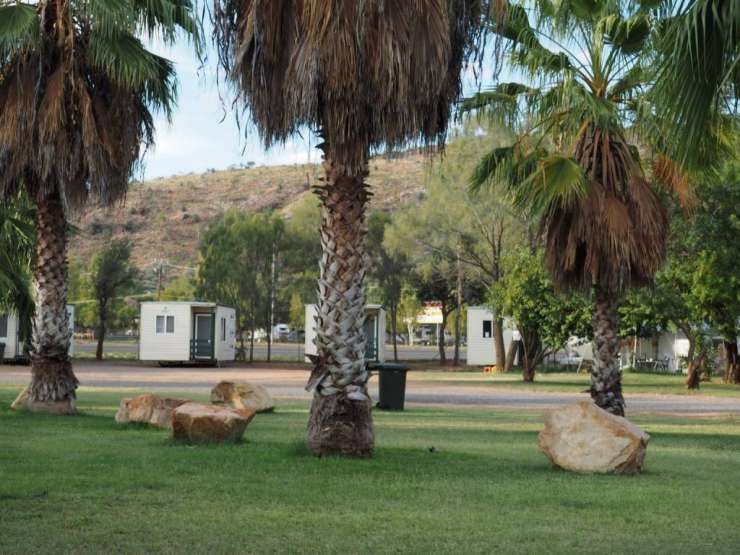 They are located near our peaceful native gardens and are perfect for travelling with pets on a budget.